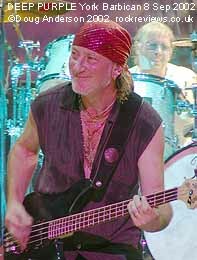 To an almost dark stage a barrage of wooshing keyboard sounds (sounding like the air conditioning unit on the album) covered the entrance of the five members of the current Deep Purple line-up, Roger Glover on bass directly in front of me with drummer Ian Paice behind and slightly more central. 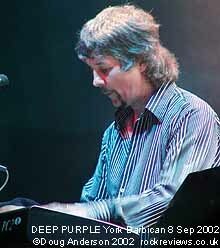 On an even higher riser at the other side of the narrow path backstage is newest member Don Airey. 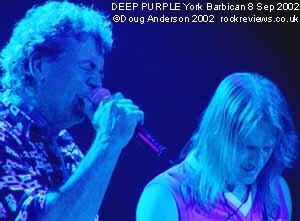 Blocking the gap between them are a set of congas which vocalist Ian Gillan pummels between tracks and to his left, our right, stands previous new boy, guitarist Steve Morse. 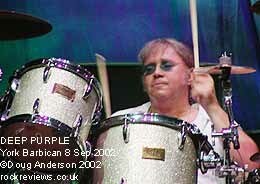 The opening number is also the title track of the bands 1971 album, FIREBALL and is infamous in that Ian Paice used a double bass drum on the studio version (for the only time I believe). Tonight there is no sign of a second drum but the beat is still pretty close to the studio recording. Glover took a short solo mid track showing his dexterity and playing at times as if his bass was a lead instrument. Standing directly in front of him I realised just how powerful his backline amps are as my body vibrated with his playing. the merest hint of Into the Fire was played to finish the track but why they didn't continue with the full song I don't understand - they managed it in '97/8. 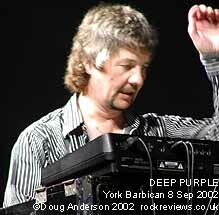 Time just for a brief "I thank you" from 'big' Ian Gillan as Don's keyboards swirledinto action and 'litte' Ian Paice kicked into a shuffle beat before Morse brought things back to the riff that introduces WOMAN FROM TOKYO. During the "so far away" line the lights moved into their first effect of the evening - everything turning red and pointing towards the circle on the backdrop as if to duplicate the rising sun flag. Don is much more to the fore in this number as a main element is the tinkling piano between bursts of Hammond organ. A slightly longer gap between songs allowed Ian to thank us once again before telling us "about a guy called Ted" and how he managed to get his "life story written down on a napkin" though he wasn't actually "Ted and he was a wine merchant but that's another story." Squeals of guitar proceeded the complex riff that introduced the only Morse era song in the set, TED THE MECHANIC - from Purpendicular. 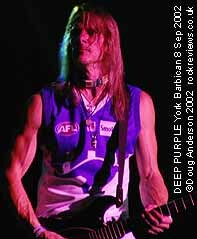 The volume subsided for the mid section which Don led until the audience began a clapalong which lasted until Steve's guitar moved things back to a rocking end with Gillan wanting to "shoot that dog". Making only marginally more sense he added "that was Ted the Mechanic whose real name was Mary* and he had a friend called Lord Longford. They of course are long gone now and not laughing in Heaven." As he continued talking Don rapidly worked the keys and little Ian brought up the drums for Who Do We Think We Are's MARY LONG. The end quietenedslowly before a final flourish. As Gillan gabbled more nonsense, "that's what happens when you eat a Marmite sandwich when you should be somewhere else," the others left the stage for Don to have his first solo spot of the evening. This he began with some parpy synth sounds before switching to the far dirtier, but much more satisfying, Hammond for some runs along those dual keyboards. The sound is different to Lord but and obviously the inspiration from another perspective but the music eventually flows towards something a little more familiar as Ian returned to the drum stool and picked up the beat to LAZY, first of several tracks from the bands most famous album, Machine Head. 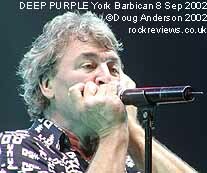 Always a rocking live number (once it gets going) it provides some nice alternating runs from Steve and Don plus some lunch wrapper (harmonica) from Gillan between verses. After complimenting the audience on their "great vibes" talk turned more serious with mention of, surely not, "recording an album over the winter and here's some that we haven't recorded yet but we'd like to do it for you now." Well, if you saw the February tour this would not be new to you as THE WELL DRESSED GUITAR has been in the set since then. It isn't so much a song as a workout mainly for Steve on his six stringed instrument. It could have been destined for one of his solo albums and unless they come up with some lyrics to accompany the tune it still may. In some ways the backing from Glover in particular reminds me of Rondo (as played by the Nice) though far shorter. "We've got a blues for you now. The basic meaning behind this is that no matter how miserable or depressed you are there's or how awful your life may be you've just gotta turn around and there's always somebody a little worse off than yourself. Its called WHEN A BLIND MAN CRIES." To accentuate the musical style blue lighting covered the less than bluesy harmonic introduction Steve wrung from the guitar. Some gentle keyboard washes filled the sound out until they slowed the mood for the lyrics which were in turn backed by quiet bass and light snare/cymbal work. Don switched to Hammond for his bluesy take on the track which picked up the pace a little before slowing once again for the second verse. 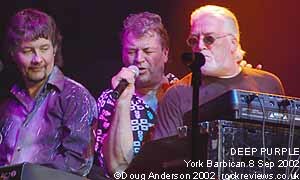 Before the final chorus the whole band worked things up before fading right back down for the final few lines which Gillan sang with just the merest hint of quiet Hammond backing. The audience certainly appreciated the song while Ian appreciated the keyboards, "Don, you played a blinder." The briefest of pauses was interupted by some rapid cymbal action and that is turn was soon joined by dexterous fretwork as the band jammed a little before Paicey switched beat to the familiar, but recently unheard Machine Head track, SPACE TRUCKIN' - another crowd pleaser. Gillan had a little more time afterwards to explain the song. "Space Truckin', written at the time the Space race was something new." "A proud Ian continued "there's a NASA mission going up later year called STS107, its a research mission, they're gonna be playing Space Truckin' as the wakeup call. That should put them out of orbit!" to cheers and laughs of approval. As an impatient Don began a Hammond drone Gillan joined the others ofstage, adding as he left, "I almost forgot, something else coming up." Don soon turned to his right and switched to electric piano to doodle around some honky tonk (which had the audience clapping along) before descending the scale and switching to some electronic effects. These continued the spacey theme of the previous song with his take on the Star Wars theme before turning back to the audience and the growling drone of the Hammond as the lights dimmed. 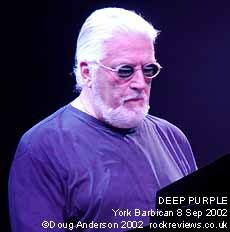 Shadowy figures returned to the stage and as the lone spot shone out towards the organ the maestro's hair had grown and greyed and in fact changed completely as Jon Lord now returned to his true position as master of the Hammond for reformation album title track, PERFECT STRANGERS. As anticipated the crowd roared their loudest approval yet and Jon smiled politely, and possibly slightly bemusedly, at the effect his appearance had. Maybe this should be a note to the others that his departure from the touring band may make a difference to the audience or at least a decent proportion of it. 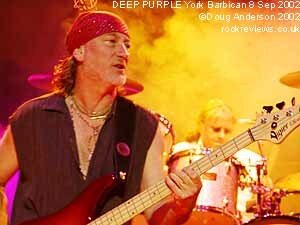 Following the "superb" song Gillan had "a Chinese song for you I think..." More like a slow cowboy song judging by the bass and slide guitar sounds Glover and Morse played with though. Maybe they didn't quite hear but judging by the smile (after the confused looks) Glover gave Gillan I think they did and just chose to ignore the cunning linguist. 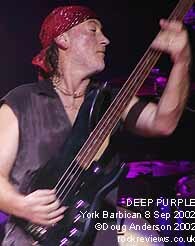 SPEED KING followed quickly and again Glovers bass was to the forefront of the sound and underpinned both Lord and Morse's solo sections before they left the stage in turn whereupon Glover himself began an attacking solo. It varied from straight plucking to harmonics and eventually ended with a touch of synth before he too departed and left little Ian to amaze with a trip around his kit. 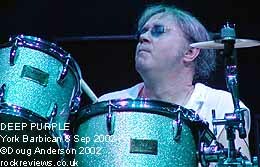 He concentrated mainly on the snare before drawing in bass and toms and speeding up to an abrupt pause. Returning to snare alone - and alone in the manner of playing with just one stick, he impressed the audience with the speed he could maintain. As this was happening the other hand was held above his head as proof the the rapid beat was coming from a lone stick, albeit using both ends at opposite sides of the head. The others returned for a rock 'n' roll jam around something from Gillan's youth, IT'S NOW OR NEVER and SWEET DREAM BABY(?) which ended with a scream that transmogrified into a short parlez against Morse's guitar answer before building powerfully to a final chorus of initial song. 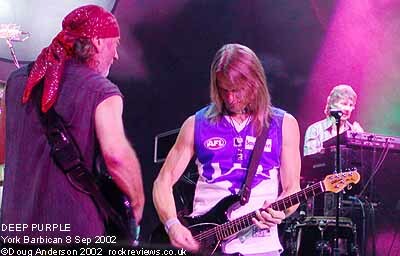 As Gillan departed the stage he pointed at Paicey to pick up the beat which Steve then matched on guitar. A southern rock tinged riff mellowed to allow a touch of showing off as Steve played reverb with his left hand and notes with the other, half way up the neck, before riffing up again and swiftly switching to SMOKE ON THE WATER. Don and Jon then arrived to take on the behemoth, while the audience took a couple of bars to realise that probably Purple's best known song had started. Soon however they were clapping along to the intro but stopped as Gillan began his vocal delivery of the autobiographic tale of what happened all those years ago on the Lake Geneva shoreline. With both Don on synth (mainly) and Jon (Hammond, what else) the sound was a bit confused at times but far less so than on the first night. I guess they've worked things out a little better a couple of days into the tour. The crowd were vocal for the chorus though Gillan still couldn't hear us which surprised me as the people around me were shouting their lungs out! ;o) As the track concluded everybody pummelled their instruments almost into submission before calling proceedings to a halt about 78 minutes after starting the aural assault. Jon and Don shook hands with each other as the others waved their goodbyes and departed the stage leaving the packed house bellowing for more. A minute or so later and they were back and without a word Paicy picked up the shuffling cymbal beat that introduced their first hit single (in the States), HUSH. Jon is back alone for Hush and plays some smooth Hammond mid track. 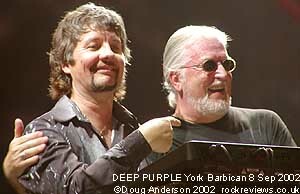 Jon departed and Don returned as Paice swapped beat to something a little less frantic which allowed Morse and Glover to slowly work towards the riff to the major UK hit that is soon recognised by the crowd, BLACK NIGHT. As they took up the chant of the riff the band gave them space to sing before Gillan arrived with the actual vocals. After some different to original guitar the heavy sound of Glover brought things to a close and again Paice provided the direct switch of beat to some train like sounds which worked up steam for the climactic HIGHWAY STAR. With that the band waved and bowed then departed, Glover last due to the inordinate number of picks thrown out to the baying audience. With a gap of about 6 feet between stage and crowd tonight there was much less contact with the audience and therefore the band left much quicker, stage right (from my perspective). I gathered a pick from the floor as the lights increased as the PA faded up AC/DC's Whole Lotta Rosie and the end had come and people began leaving probably reasonably satisfied. I was a little disappointed that apart from an accidental track swap the set remained as before and thought that the scene had now been set for the tour. Short and sweet and early to bed. Don certainly was a decent substitute for Jon and added his own slant to many of the tunes player but the Hammond sound was not quite as up front as Lord had been in February. Even Jon didn't seem quite so up as those a half dozen months ago. Afterwards with the early end I popped back up to my B&B to offload the SLR before heading back to grab a bite to eat somewhere and see who was hanging about afterwards. 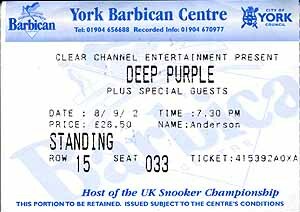 On my initial pass I didn't recognise anybody so had a wander and found a chippy before returning to find Jon Lord signing a variety of tickets, CD sleeves and album covers - a rarer sight these days. I arrived as he was about to get on board the bus having obviously signed a huge batch of covers already. I merely passed him a copy of JY's 4 track promo CD as in February we'd had a brief conversation about Greenslade and I'd mentioned John. 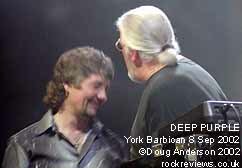 Almost as soon as Jon stepped up into the bus Roger Glover appeared and people flocked to him. A couple of minutes later Ian Gillan followed and it was interesting to watch about half the crowd around Glover suddenly swap allegiance and surround Ian. It seems my hunt for sustenance meant I'd missed Don, little Ian and Steve Morse as when Gillan finally climbed aboard the door swung shut and the bus slowly moved away leaving the roadies loading the last of the gear into the bus while the drivers sat in their own comfortable bus watching satellite TV judging by the dish sat in front of it. 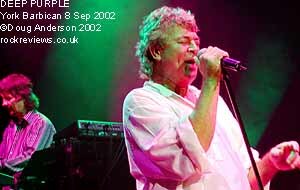 *Playing Ted was a mistake by Gillan rather than an organised restructure of the set judging by the look on the faces of the other as he introduced the track. Initially I though this may mean an added or different track in the set tonight but that proved not to be the case and I think the tour will continue with this short set for the duration. This page is Copyright © Doug Anderson 2000 - 2002. Created: 9 January, 2002. Last updated: 15 October, 2002.